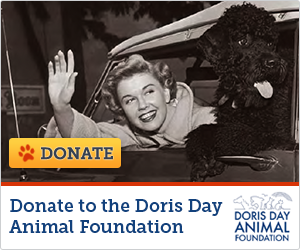 During the months of January, February and part of March, Doris fans have had the opportunity to call in a personal message to Doris on our toll free line (for both this site and our sister site, www.songsandmemories.com.) Those calls (posted below and on our sister site) will be recorded on an audio CD and sent to Doris for her birthday. In addition, fans were also given the opportunity to send a picture of themselves with or without their pets and a written message to Miss Day. These will become part of a coffee table published book that DD will also receive for her birthday. Last, but not least, fans have left written messages on one or all of the following Facebook pages, and viewers can see them there anytime: "The Magic of Doris Day"; "My 'Secret Love' Affair with Doris Day", "Happy Birthday Doris Day" and "Songs and Memories".